With an impressive 89 million views, the first trailer for Marvel's Black Panther clawed past the second teaser for Star Wars: The Force Awakens to become the tenth most-watched trailer in the first 24 hours. After making its debut on Friday night during Game 4 of the NBA finals, the Black Panther trailer seemed to be the only thing people wanted to talk about. 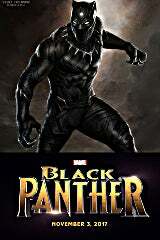 Seeing as though it is the first big-budget superhero film featuring a predominantly-black cast, Marvel Studios has to ecstatic with strong interest and overwhelming positive responses it has received. When compare to other Marvel films, the 89 million views -- which includes the 19 million that viewed it during the first quarter of the basketball game -- ranks third best. Just two months ago, Thor: Ragnarok set a new Marvel (and Disney) record with a jaw-dropping 136 million views in just 24 hours. Before that, Captain America: Civil War held the flag for Marvel with 94 million views. As for the all-time, the trailer for Stephen King's IT is still top-dog with 197 million views. It set the recod in March, easily surpassing the previous record of 139 million views that The Fate of the Furious received last December. After the events of Marvel's Captain America: Civil War, King T'Challa returns home to the reclusive, technologically advanced African nation of Wakanda to serve as his country's new leader. However, T'Challa soon finds that he is challenged for the throne from factions within his own country. When two foes conspire to destroy Wakanda, the hero known as Black Panther must team up with C.I.A. agent Everett K. Ross and members of the Dora Milaje, Wakanadan special forces, to prevent Wakanda from being dragged into a world war. The film stars Chadwick Boseman (Get on Up), Michael B. Jordan (Creed), Lupita Nyong’o (Star Wars: The Force Awakens), Danai Gurira (The Walking Dead), Martin Freeman (Sherlock), Daniel Kaluuya (Get Out), with Angela Bassett (American Horror Story), with Forest Whitaker (Rogue One: A Star Wars Story), and Andy Serkis (Avengers: Age of Ultron). Additional cast members include Letitia Wright (Urban Hymn), Winston Duke (Modern Family), Florence Kasumba (Emerald City), Sterling K. Brown (The People v. O.J. Simpson) and John Kani (Coriolanus). Ryan Coogler directs from a screenplay he co-wrote with Joe Robert Cole. Marvel's Guardians of the Galaxy Vol. 2 is in theaters now. Spider-Man: Homecoming lands on July 7, 2017, followed by Thor: Ragnarok on November 3, 2017. After that Black Panther debuts on February 16, 2018, while Avengers: Infinity War hits theaters on May 4, 2018. Ant-Man and the Wasp is slated for July 6, 2018, followed by Captain Marvel on March 8, 2019.